A pithivier is a round, domed pastry pie decorated with distinctive spiral markings drawn from the centre of the dish. Thought to originate from the French town of the same name, a pithivier is traditionally made from puff pastry and can contain sweet or savoury fillings. This collection of pithivier recipes should provide some fantastic inspiration for irresistibly golden centrepieces, perfect for a weekend meal. Sally Abé's easy pithivier recipe contains contrasting layers of chicken, sage and squash, while the Galvin brothers load several varieties of game into their pithivier, served with carrot purée and glazed onions. 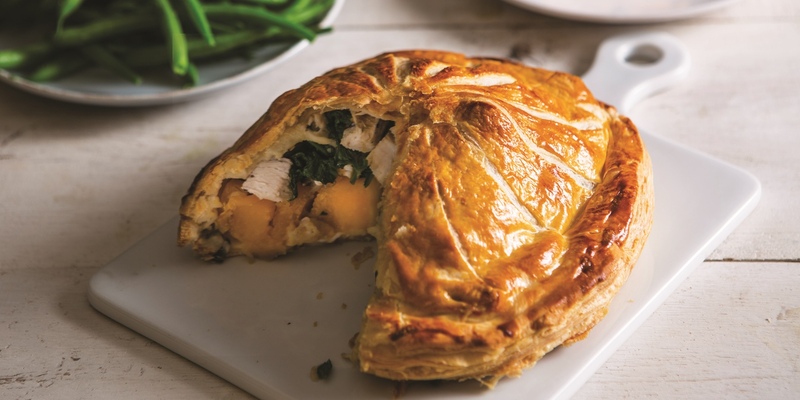 For a vegetarian take on the classic pithivier try Danny Kingston's Spring vegetable pie recipe, or Karen Burns Booth's Mushroom and thyme pithivier, a vegan recipe which would make a Sunday lunch alternative for everyone to enjoy.